This 5k route in Castleisland is used by An Riocht Athletic Club on a regular basis for a number of races. Race headquarters is usually at the Sports Centre and track. 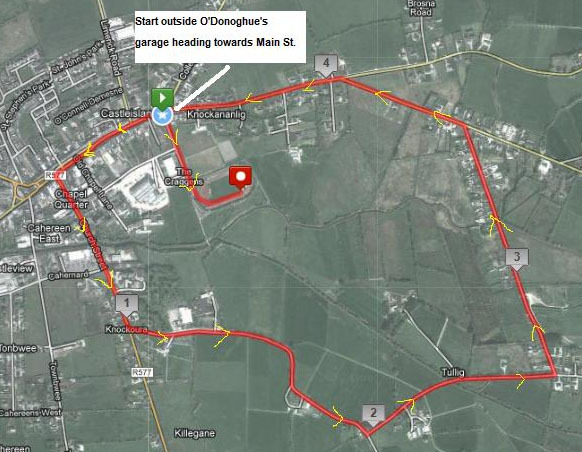 The race starts out on the main road outside O'Donoghues garage. You then run through the town before doing a loop on quiet country roads to the south-east of the town. This is the only section where the course overlaps by around 200 metres. The road junction near the An Ríocht AC track. First time round, it's just after the start and you run straight through the town. As you get near the end of the race, you turn left here and down the quiet road towards the finish on the track. 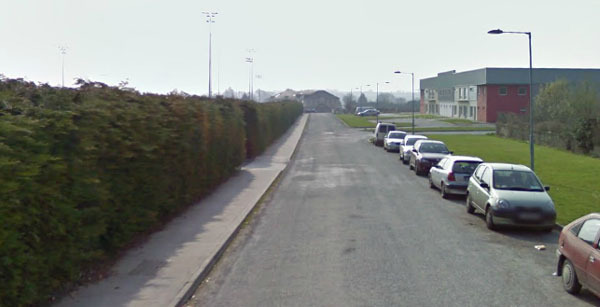 If you are not familiar with the location of the An Ríocht AC track and clubhouse then as you can see from the the photo above, it is clearly signposted from the main road that runs through the town. Overall....A reasonably fast course. There is only one real hill but it's reasonably short.